Guwahati, Aug 17 :Three crashes in five years, which claimed 27 lives including that of former Arunachal Pradesh Chief Minister Dorjee Khandu, have made the All Arunachal Pradesh Students’ Union (AAPSU) put the heat on the Congress government in the state to ground the ‘flying coffins’ of Pawan Hans Helicopter Ltd (PHHL). The influential students’ body in the Northeast state has urged the Arunachal Pradesh Chief Minister Nabam Tuki government to immediately terminate the MoU it had signed with PHHL. 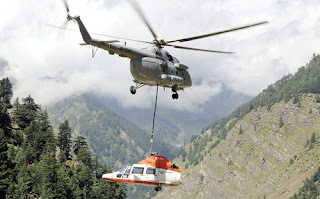 “The Pawan Hans Helicopter Ltd has become synonymous with flying coffin in our state,” the AAPSU said in a representation to the Chief Minister. “In the past there have been quite a few mishaps and that should have been enough to awaken the government from deep slumber. But to our utter surprise, the so-called flying coffins are still flying,” it said. The AAPSU said that the latest crash, which occurred in the state’s Tirap district on August 4, has once again exposed the inefficiency of the helicopter service operator. “The incident indicates the choppers used in our state are not fit to fly in the hilly terrains,” it said. The crash had claimed the lives of Tirap district Deputy Commissioner, Kamlesh Joshi, and pilots M S Brar and Rajeev Hoskote. The Dauphin VT-PHK helicopter had crashed inside a deep gorge between two steep mountains within minutes after take-off from Khonsa. The bodies were found by the commandos eight days after the incident. On that day, Joshi, who had joined as Tirap district Deputy Commissioner in June, 2013, was to attend a meeting of the Ministry of Home Affairs (MHA) in New Delhi. He was born in 1983 and belonged to the 2010 IAS batch. Officials of Arunachal Pradesh government and PHHL said the Tirap crash was being investigated. “The next course of action will depend on the ongoing enquiry and guarantee of air safety,” a senior government official told The Sunday Standard. Meghalaya had in 2011 suspended PHHL services. In due course, it came to light that travel requirements made the government allow the public sector undertaking (PSU) to operate in the state despite expiry of license. Back in 2004, a chopper crash near the state’s capital, Shillong, had claimed the lives of ten people, including a cabinet minister and two MLAs. Apart from Arunachal and Meghalaya, the PHHL operates in Nagaland, Tripura, Mizoram and Sikkim. The license is renewed annually. In the Northeast, communication is a major bottleneck. So, the people prefer to travel by helicopters as it is affordable. The PHHL operates here on 75 per cent subsidy of the MHA. This does not include recovery from passengers. The state government provides for the remaining 25 per cent. The private airlines are not so lucky though, for they are not considered eligible for subsidy. The high operational cost left two private operators to shut shop after a brief stint in Arunachal Pradesh. In 2011, the PHHL had drawn flak from the public due to safety issues after two choppers crashed within a span of just ten days. In one of the incidents, five people, including Khandu, were killed. Another crash claimed the lives of 19 people. The operations were suspended then, but services resumed in 2013. The latest crash has brought to the fore the safety issues, again. September 22, 2004: Meghalaya Community and Rural Development Minister Cyprian R Sangma, two MLAs and a former Deputy Speaker were killed in a Pawan Hans helicopter crash, near Shillong. August 6, 2010: A Pawan Hans crew died by falling from 10,000 feet at Namsai in Arunachal Pradesh, while trying to close a door that had flung open mid-air. April 19, 2011: A Pawan Hans Mi-17 helicopter, en route to Tawang from Guwahati, crashed while trying to land at Tawang. Of the 23 people on board, 17 were killed on the spot. Two others succumbed later. April 29, 2011: A Pawan Hans helicopter carrying former Chief Minister Dorjee Khandu and four others, crashed. All them died. August 4, 2015: A Pawan Hans chopper carrying Tirap Deputy Commissioner Kamlesh Joshi and two pilots on board crashed, killing all the passengers.